The Newark Police Department continued its mission to strengthen trust within the community during a town hall discussion with students at Berkeley College in Newark, NJ, on December 5, 2017. 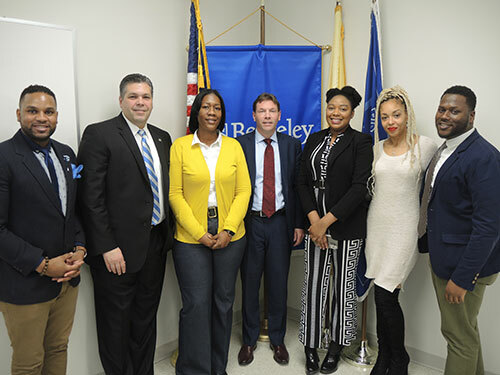 A panel comprised of police officials, Berkeley College students and alumni answered questions from an audience of faculty and students, many of whom take courses in the Legal Studies and Justice Studies – Criminal Justice programs at Berkeley College. “Providing students with direct access to officials tasked with protecting and serving our communities aligns with the college’s mission to prepare our students for impactful careers in law enforcement and other public service professions,” said Michael McAteer, DBA, Dean, Berkeley College School of Professional Studies. The panelists addressed initiatives police are taking to better connect with the community, reasons for disconnect between officers and citizens, and the challenges police face every day in law enforcement. 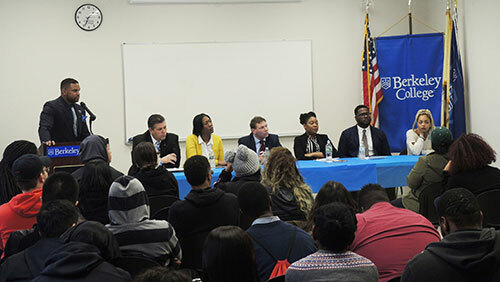 “With everything that is occurring in the news, both nationally and locally, dialogues like these are crucial for students to better understand how they can better collaborate with police to serve their communities,” said Earl Brown, Campus Operating Officer, Berkeley College in Newark, who moderated the panel discussion. Click here to watch a recap of the town hall discussion that appeared on a recent broadcast of NJTV News (starting at the 16:04 mark). Photo Captions A and B: (Top) Berkeley College hosts a town hall discussion with students and officials from the Newark Police Department at its campus in Newark, NJ, on December 5, 2017. (Above) Pictured from left to right are Earl Brown, Campus Operating Officer, Berkeley College in Newark; Capt. Adolph Perez; Sgt. Latasha Taylor; Lt. Robert Henningsen, all from the Newark Police Department; Berkeley College students Lachanee Scott and Chevonne Newman; and James Marshmon, Berkeley College alumnus and Student Success Coordinator, Berkeley College in Newark. The discussion often turned to the role that media has played in creating friction within the community. Police officials and student panelists both acknowledged the need for a stronger balance of the positive and negative outcomes being reported on in the community. When addressing the challenges that police officers regularly face, Sgt. Latasha Taylor admitted there is constantly “the fear of not coming home at the end of the day.” Capt. Perez also added that a career in law enforcement could take its toll on family members. “When you become a cop, your family becomes a cop,” he said. Photo Caption C: On the left, Sgt. Latasha Taylor of the Newark Police Department addresses students at a town hall discussion at Berkeley College in Newark, NJ, on December 5, 2017. Pictured with Sgt. Taylor is Earl Brown, Campus Operating Officer, Berkeley College in Newark (standing) and Capt. Adolph Perez. On the right, Berkeley College student Chevonne Newman addresses the panel about the disconnection between police and community. Pictured with Ms. Newman is Berkeley College student Lachanee Scott and James Marshmon, Berkeley College alumnus and Student Success Coordinator, Berkeley College in Newark.